Our tours launch daily and are two hours long. Tours are suitable for all ages and experience levels, from beginner to expert. You will be kayaking on a tandem, sit on top kayak that is easy to paddle. We provide the opportunity for our guests to get a hands on experience as they explore and learn about Central Florida’s amazing coastal ecosystems and its inhabitants. 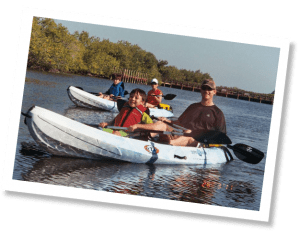 We will set out to enjoy the tranquil serenity of the Indian River Lagoon and while doing so, we will be on the lookout for various species of birds, Dolphin and other marine life that call the lagoon and Intercoastal Waterway their home.